Stream Windows PC Sound via SoundSeeder - soundseeder.com | Play music simultaneously on multiple devices. 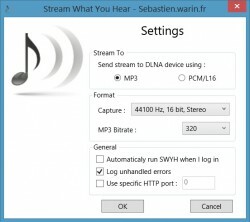 SoundSeeder is able to stream the sound of a Windows PCs via dlna. This feature allows you to stream music played from Spotify, Youtube or any other third party application to your SoundSeeder Speakers. You should now see the “Stream What You Hear” app listed as device. Select it and start the “MP3” audio stream. SoundSeeder will now play your Windows PC sound. Please note: The playback via SoundSeeder will be delayed by about 5s. The PC sound can be muted without disturbing the audio stream.